Current:Can Hybrid Construction Equipment Stand Up Against Diesel? The latest hybrid models from John Deere, the 644K and 944K wheel loaders, boast a long list of benefits over traditional drivetrain systems. Reduced fuel consumption, lower emissions, even improved performance, but what do those things really mean? Let’s get into the details. A hybrid loader is designed to capture regenerated energy as it's being created to power the machine, reducing the amount of energy required from diesel fuel. John Deere hybrid heavy equipment uses roughly 25% less fuel than conventional heavy equipment, and with diesel being one of the most significant operating costs on the job site, better fuel economy can equal significant savings. Hybrid construction equipment consistently runs at the most efficient speed and torque range for the task at hand, allowing operators to get fuller buckets every time. Not only does hybrid equipment run efficiently, with the electrification of subsystems, it can also be customized using software and tailored to suit a specific customer’s use case. Hydraulic systems, for example, do not have to be dependent on engine speed, which improves performance and reduces engine load. Brushless motors and A/C generators on hybrid construction equipment contain fewer wear parts and require less overall maintenance than conventional diesel equipment. Plus, features like coast control and standard traction control mean hybrid equipment owners see extended life on wear parts, including brakes and tires. While hybrid equipment isn’t emissions-free like electric construction equipment, it does significantly reduce emissions compared to diesel-only powered models. All hybrid construction equipment from John Deere is Tier 4 compliant to meet the E.P.A. and California Air Resources Board emissions standards for new equipment. Tier 4-compliant engines reduce emissions by over 95%. The hybrid drive system operates in a reduced engine speed range that increases the life of the engine compared to conventional drive systems. John Deere is so confident in the long-lasting drive system that they’ve backed the 944k hybrid loader with an extended 8-year/20,000-mile warranty on electric drive components including wheel motors, generators, power inverters, and brake retarders. The ability to recoup energy during deceleration enables hybrid equipment to operate at a higher level of efficiency than traditional diesel engines. The engine can use the recycled energy to power the equipment, reducing fuel consumption and the load on the engine. Regardless of the stated benefits, operators and construction business owners are wary of the new technology and smaller engine size. What contractors are most interested in is if heavy hybrid equipment can stand up to the real-life tests of the job site. 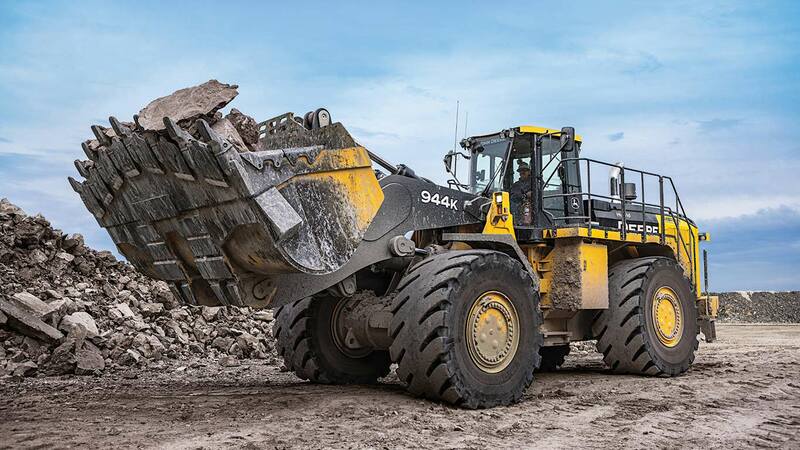 Construction Equipment Magazine conducted a field test comparing the 644K Hybrid to the conventional 644K wheel loader. The results were clear: The Hybrid 644K got the job done faster and burned less fuel. Test operators, Chris Tomblin, and Jose Perez, used the brakes approximately 75% less when operating the hybrid model. Tomblin and Perez had never operated a hybrid loader prior to the field test, and both reported that it only took them about 10 minutes to feel comfortable in the cab. Given the option, both Tomblin and Perez agreed they would pick the hybrid over the conventional model because it gets the job done faster and offers cost savings on maintenance and fuel. Hybrid construction equipment does come with a higher price tag than diesel equipment in a similar size. A new 644K hybrid wheel loader, for example, is about $20,000 more than the 644K wheel loader with a traditional transmission drive. The number of hours you expect to use the equipment can help you decide on whether the higher up-front cost is worth it. Another factor that may impact a customer’s buying decision on the 644K is the engine. The hybrid option is currently only available with the smaller Interim Tier 4 engine, while the traditional drive has a larger Final Tier 4 engine. John Deere has plans to release a 644K Hybrid with the FT4 engine, but it won’t be available until late 2020. Until then, the Final Tier 4 engine on the 644K Diesel may be the deciding factor for customers in states like California that have the most restrictive emissions regulations. Adopting hybrid construction equipment has been slow as practical equipment buyers have waited to see how this new technology performs in different heavy-duty applications, and if the higher upfront cost would be worth the promised savings. It’s been over six years since the John Deere 644K hybrid loader was first introduced and the improved performance and lower operating costs are undeniable. Even more exciting is John Deere’s ongoing commitment to equipment innovation and understanding their customer application needs as they continue to develop new machinery in this category. At Papé Machinery Construction and Forestry, we’ve seen more customers choose hybrid construction equipment over traditional equipment in the last year, and we expect that trend to continue. Stop in today to see the hybrid equipment options available or check out our 360-degree video featuring the John Deere 644K Hybrid Wheel Loader in action. Use your mouse to control the camera. For more information about hybrid construction equipment including the John Deere 644K and 944K, contact your local John Deere dealer, Papé Machinery Construction and Forestry.